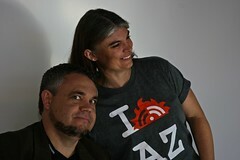 [caption id="" align="alignleft" width="240" caption="Me and Dani Cutler - Podcamp AZ 2010"] [/caption]So here's a quick note to say that I've posted the audio of my Podcasting for Authors talk last weekend at PodCamp AZ 2010. It was captured, edited and hosted by the supremely cool Dani Cutler of the Truth Seekers political podcast. And it's over at my hopefully-not-at-all-douchey digital marketing site, A Simpler Way. I'm not linking directly to the file here simply because it's a 50+ minute file and I don't want to be called a hypocrite. That's too damned long for a podcast episode. And this isn't a podcast episode. It's an audio file. If you want it, follow the links. Authors interested in using digital marketing to grow their fan base may find it of value. The rest of you... not so much.